Despite what the reading says, the fuel economy is actually about 44.15 mpg (6.39 litres per 100km) as I could only squeeze in 51.86 litres. I suspect all the free wheeling skews the onboard computer a bit. Just goes to show that if you drive very very carefully - they call it driving like a christian on TopGear - and bung in a fair amount of free-wheeling you can get some pretty impressive fuel consumption. 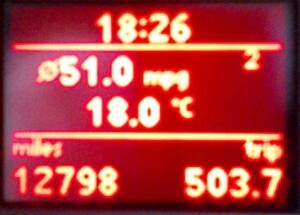 I don't think I've ever got 500 miles out of a 55 litre tank of petrol before - diesel yes, petrol no. That said, I've always driven cars with biggish engines. Thanks to the supercharger and turbo, the Golf GT only needs a little 1.4 litre engine which obviously helps with the fuel economy. Now to see how many 500+ mile tanks I can get in a row.